Born in Hampton Virginia, Jeff grew up near Philadelphia, Pennsylvania. In Philadelphia Jeff studied music at The Philadelphia College of the Performing Arts(now called University of the Arts) and received his Bachelor in Music and Music Education with a Jazz Minor. At The Philadelphia College of the Performing Arts he studied saxophone with William Zaccagni, flute with Adeline Tomasone, jazz theory with Larry McKenna and arranging/composition with Evan Solot. In ‘Philly’ Jeff pursued a career as a free-lance saxophonist both in the classical and jazz worlds. Being a woodwind doubler he was active in the theatres, supper clubs, cabarets, jazz clubs and recording studios in the Tri-State Area(Pennsylvania, New Jersey and Delaware), Baltimore, Washington D.C. and New York. Jeff already had been playing in many Philadelphia Area big bands while attending high school. Shortly after graduating college Jeff became a member of the Al Raymond Big Band and later becoming lead saxophonist of the organization. He also was a primary staff arranger for the band along with Larry McKenna, Grant Whisler, Bob Lowden and Walt Stuart. In addition, Jeff served as music director and conductor for many the band’s stage shows and tours with guest artists such as clarinetist Buddy DeFranco. Jeff also was lead saxophonist and arranger for the Walter Jay WPEN Radio Orchestra and Triple Threat Quartet (saxophone, clarinet and flute ensemble). He also supplied many scores to Music Minus One Records and Pocket Books. As a freelance musician some of the jazz artists Jeff has played with include Lou Rawls, Mel Lewis, Dave Liebman, Urbie Green, Brian Pastor Big Band, Ray Anthony Orchestra and Buddy DeFranco. If that was not enough Jeff also became Music Director and Director of Bands at St. David School in Willow Grove, Pennsylvania. This music organization received countless national gold medal awards in concert band and jazz ensemble. Through his work there Jeff was asked to become Artistic Director and Conductor for the Philadelphia Archdiocesan Elementary Jazz Band. This group also went on to achieve excellence in performance. Jeff relocated from Philadelphia to London in 2004. Jeff has appeared many times with London based musical organizations such as the Pete Cater Big Band, the Jay Craig Orchestra, the Hot Orange Big Band, the Syd Lawrence Big Band, the Jimmy Cannon Big Band, the Wright Stuff and the Soho Jazz Orchestra. Jeff Darrohn is a recording artist for JAZZED MEDIA RECORDS of Colorado, USA. 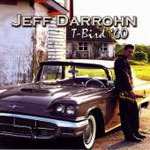 The recording “T-BIRD ‘60” was released in the US and UK markets October 2006. It is getting airplay on jazz stations nationwide in the US and BBC Radio in the UK. The album consists of Jeff’s original music for six saxophones and rhythm section. On the recording Jeff recorded all the saxophone parts and solos himself along with a superb rhythm section consisting of Tony Vigilante, Dave Posmontier and Craig Thomas. The album was recorded at Morning Star Studios. This configuration is now performs live in London as it did in Philadelphia. Billed as SAXON!, the group uses the very best jazz musicians in London. Some of the members include Jay Craig, Frank Griffith, Michael Coates, Matt Hope, Pete Cater, Clive Dunstall, Dave Jones, Adam Bishop, Aaron Liddard, Bob McKay and singer Joan Viskant. SAXON’s performances also include jazz standards and vocals scored for six sax and five flute/bass clarinet sounds. In the US his group performed under the name THE SAXTET. In 2007 Alfred Music Corporation began to publish Jeff's jazz ensemble music for schools beginning with his London Far East Groove. As a composer his compositions and arrangements have been featured by the Brian Pastor Big Band, Pete Cater Big Band, Jimmy Cannon Big Band, Soho Jazz Orchestra, the Open Ear Orchestra in conjuction with the London Philharmonic Orchestra, Al Raymond Orchestra, WPEN Big Band, Sarah Morrow, Hal Schiff Orchestra, and many US school jazz and concert bands including the LaSalle University High School Jazz Band. In January 2006 the Pennfield Middle School Jazz Band premiered a composition of Mr. Darrohn’s at the IAJE Conference in New York City. Also in January the Lincoln Center Jazz Orchestra and the Juilliard School of Music Big Band invited Jeff to submit his compositions. His music has also been performed by the Towson State University and Peabody School of Music. Recently, the Brian Pastor Big Band recorded is music on their CD recording “COMMON MEN”. His music is published by Alfred Music, Dorn Music, JWPepper & Son Online Service and Jeff Darrohn Music. In the future Mr. Darrohn is planning to expand his commissioning of new music works for University, Middle and Elementary School jazz ensembles. He is also planning to form and record a jazz big band album in London in partnership with the best English, American and Canadian Musicians/Composers. He continues to learn and borrow from the London jazz and ethnic music scene and combine it with his acquired American west coast style of which composer Bob Florence has been a major influence. Jeff is also planning to start an online education service to musicians and students wishing to compose jazz music for big band and other musical ensembles. Jeffrey Darrohn is a member of ASCAP, IAJE, MENC, PMEA, Local 77 Musicians Union and the Musicians Union. All About Jazz musician pages are maintained by musicians, publicists and trusted members like you. Interested? Tell us why you would like to improve the Jeff Darrohn musician page.